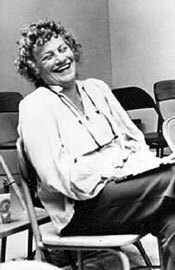 Viola Spolin was the creator of theatre games. Anyone can play them, learn to stay in the moment, and allow whatever magic is created to freely flow. While Viola’s games provide an absolutely essential element for the actor (by teaching him/her to trust his instincts and to remain open & relaxed), they are also beneficial to any individual looking to tap into his/her intuitive side in order to build confidence and creativity. And they’re fun! For more information about Viola Spolin, check out the Viola Spolin Biography and The Spolin Games from The Spolin Center.